The 12th Man at Kyle Field. 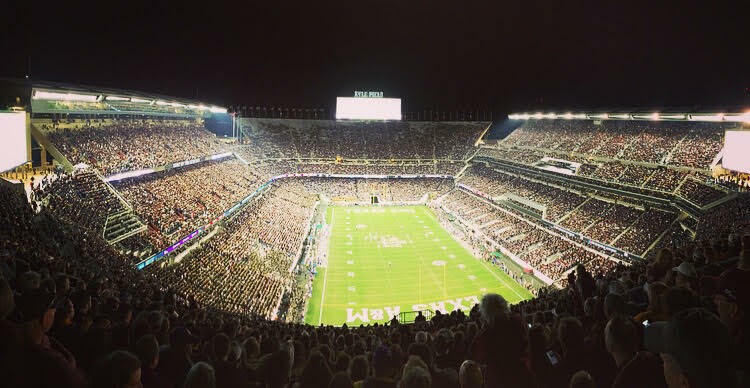 ​Kyle Field has been home to the Texas A&m Aggies since 1905. At that time the stadium sat 500 fans. 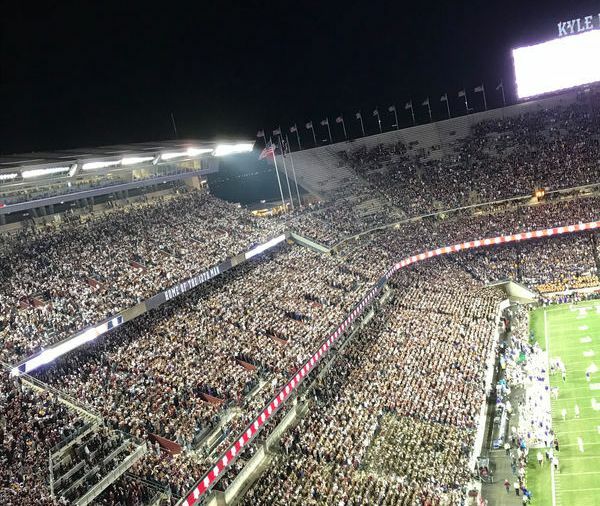 Fast forward to 2019 and the stadium is the 4th largest in College Football with a capacity of 102,733. The latest renovation took Kyle Field to another level. The 483 million dollar renovation left no area untouched. The stadium is broken up in roughly 3 levels. the stadium is fully enclosed by seating outside some slight gaps in the upper level. ​The lower level is chairback seating that is completely enclosed. The main feature of the lower level is the Hall of Champions. It is located on the West side of the stadium and is a massive 100 yards long and 60 feet tall! you will also spot a couple of escalators on this level to help fans get up to the upper levels. The second level is primarily club and suites. The renovation brought the stadiums suite total to 120. The upper level features a mix of chairback seating and bleacher seats. The press box is located on the east side of the stadium. All three scoreboards can be found here as well. Kyle Field is home to one of the largest scoreboards in College Football. When it was revealed in 2014 it was the largest scoreboard in College Football sizing up at ​163 feet wide by 47 feet high. The stadium is located in the South Endzone. The North Endzone features two smaller (54 feet wide by 36 feet high) scoreboards. You can see LED ribbon scoreboards primarily right above the lower level. The exterior of the stadium is primarily brick. 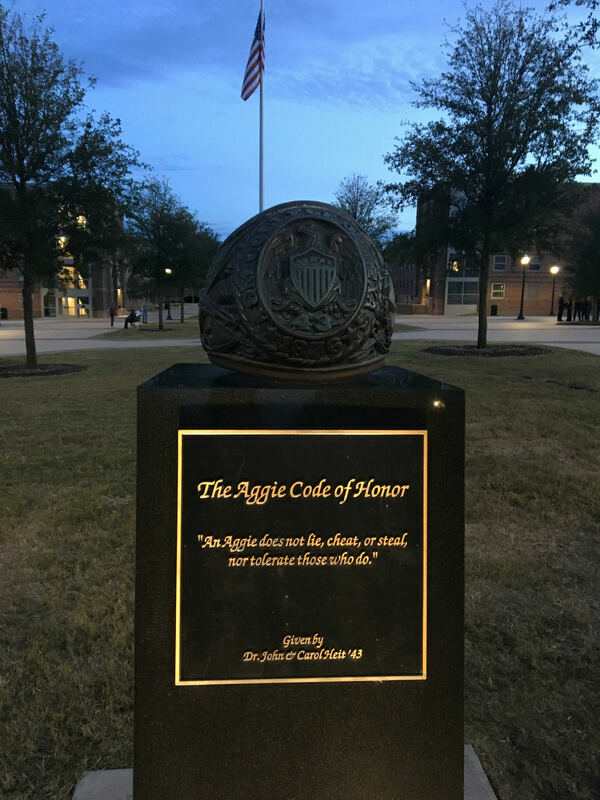 They have several attractions to see including the 12 Man Statue, Reveille Burial Site, War Hymn Monument and several pillars of former players accomplishments. You can also check out the Ford Hall Of Champions locate by gate 3. The renovation was the most expensive in college sports. It shows. No other college stadium matches this level of luxury. Nothing was left untouched. Nothing. ​#1 Texas Avenue and University Drive are where you will find most of your food options. If you want Tacos Torchy's and El Fuego were highly recommended to me. #2 Not too far away from those locations is the Bonfire Memorial. This is your best chance to see it. #3 From there you can enter at the East Lawn to begin seeing the campus. To give you an idea of how big the campus is from the Bonfire Memorial to George H.W. Bush Presidential Library is about 3 miles. 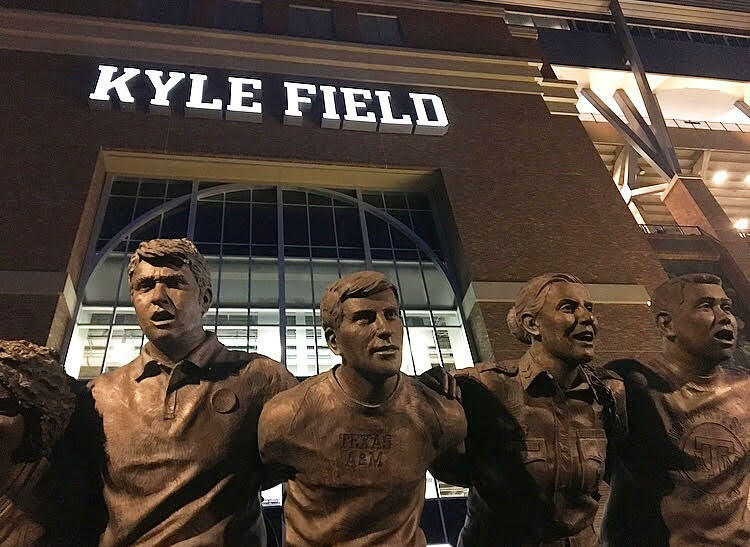 #4 Spend some time right around Kyle Field as they have several great photo opportunities. #5 Head inside Kyle Field! Kyle Field: This stadium doesn't get enough love. Texas A&M went all in on their last renovation of Kyle Field and cashed in. They didn't miss an inch of this facility. From outside the stadium, to the exterior, interior and honestly, everywhere you look. The amount of chairback seating that you can find is unmatched in most college facilities. A lot of them go with bleacher seating just to get as many fans as they can but in turn that is not a benefit to the fan. Props to A&M for that. I am huge fan of stadiums that don't have open ends. A&M hits on that too. I love the structure of Kyle Field with several different levels rather than one or two massive ones. It adds a unique quality that isn't too common in College Football. Honestly, I could go on and on about this facility. End of the day, to date, this is the best stadium I have ever been too. When someone asks me "what stadium should I visit?" My answer will be Kyle Field. Texas A&M: This one of the largest campuses I have ever been to. After a little research, the campus is in the top 10 for square feet. Making it the second largest campus I have stepped foot on. They have so many details that you want to see, but It is going to take you some time. As I mentioned earlier, the Bonfire Memorial to George H. W. Bush Library is about 3 miles by car. Military Walk: One of the nicest parts of campus is just off Ross Street. Nearby is the Century Tree. Bonfire Memorial: Located in the Northeast corner of campus. I am sure I missed something! Enjoy your walk at Texas A&M. Scoreboard: One of the largest scoreboards in College Football lands in the South End Zone of Kyle Field. The renovations for the stadium included the scoreboards and they didn't go cheap they went all in. The two scoreboards in the North End Zone are perfect size for their locations. 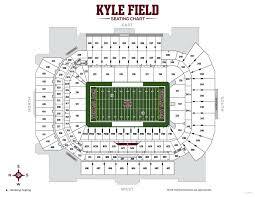 Plus the addition of ribbon boards brings Kyle Field to the top tier in the scoreboard department. Yes, it was a historic, 7 overtime thriller! I have to take in effect what happens on most nights, not just the game that I was at. If we are being honest the odds of Kyle Field seeing another game go 7 OT's while I'm alive is going to be rare. No worries though, Aggie fans are the most involved fan base I have ever seen! The whole stadium is into not only the game but what the Yell Leaders are doing. 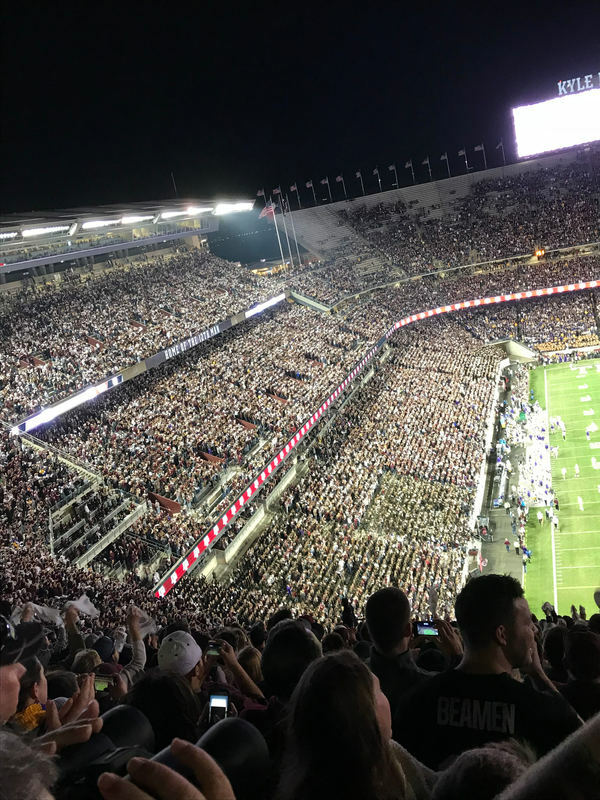 Typically the student section would only be involved but you can see people throughout Kyle Field getting involved. I will admit, I was skeptical of what the Yell Leaders would bring to the table. I am skeptical no more! They fill Kyle Field with energy. From pre-game to post-game they bring it. When the 'Aggie War Hymn' gets going prepare to lock arms with a fellow Aggie. On TV they make it seem as if it is only the 12th Man, it is the whole entire stadium that participates.